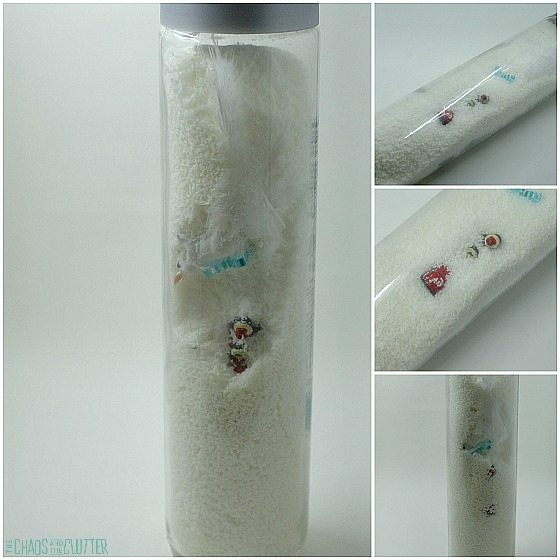 In the words of my kids, this is the “cutest sensory bottle ever”! 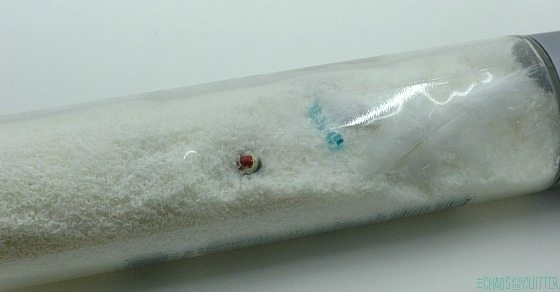 I came up with the idea to make a melted snowman sensory bottle when I was at the craft store and saw an adorable snowman making kit. I imagine what would be left of a melted snowman and found a way to represent it in a discovery bottle. 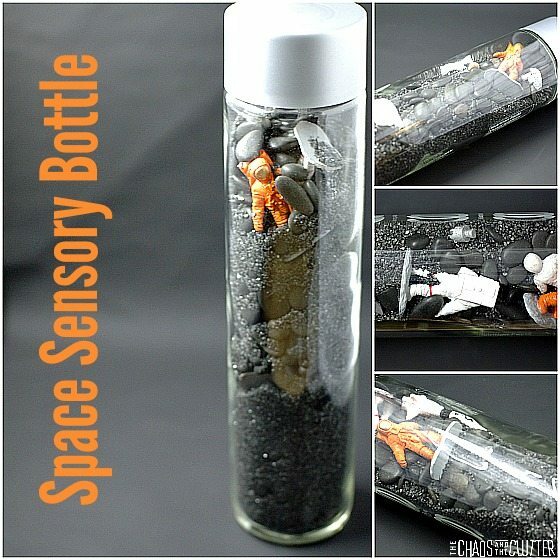 When I set out this year to create a new sensory bottle every month, I worried that I would run out of ideas, but they always come from some inspiration or another. It’s the middle of November and where I live in Canada, there’s usually enough snow to have built a snowman family in the yard by now but as of today, there isn’t any snow on the ground so this melted snowman sensory bottle really got the kids’ imaginations going. 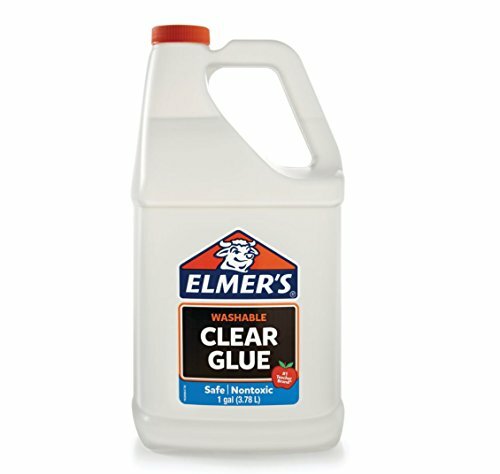 Empty the water from the water bottle and squirt the clear glue in. Add warm water to almost fill the bottle and add the lid back on and then shake the glue and water together for a bit to combine. 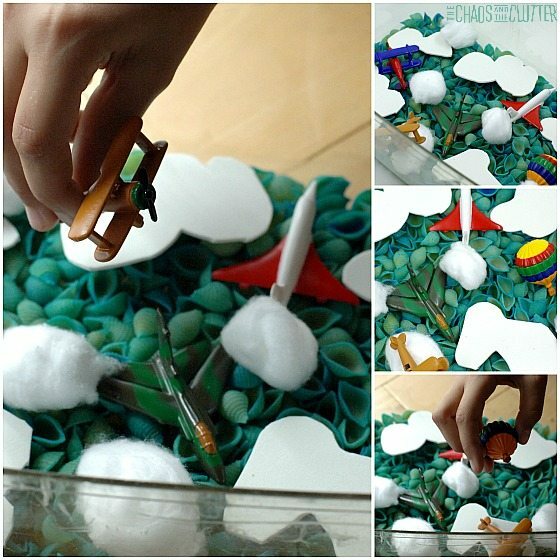 Little ones are often very helpful with this task! Add the other items into the bottle. The twigs are for the arms, the black beans for the mouth, the fabric strip for the scarf, the dark buttons for buttons, the colourful larger buttons for the eyes, and the carrot shaped sponge for the nose. 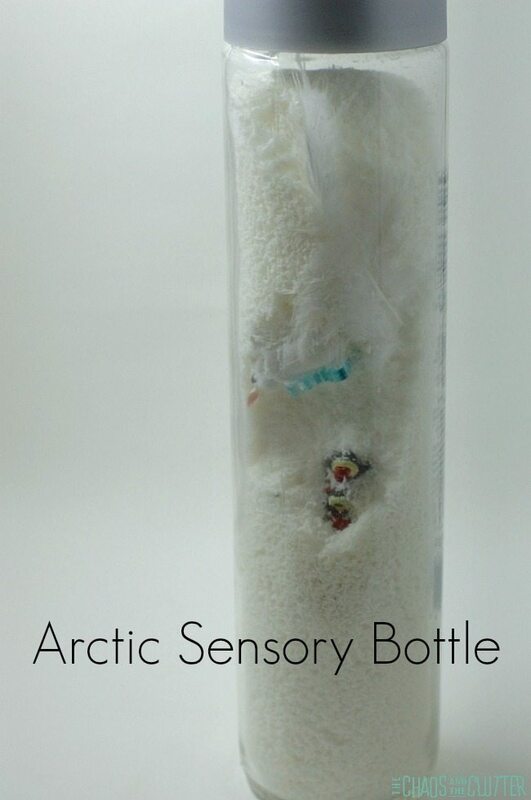 Add the lid back on and your melted snowman sensory bottle is ready to use for play. If you have younger children, you may want to hot glue the lid in place so they can’t open it. 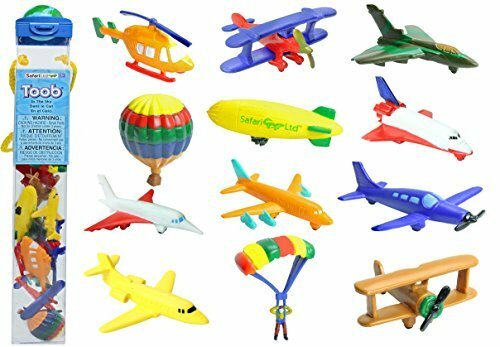 As with all sensory and exploration activities for kids, adult supervision is of course recommended. 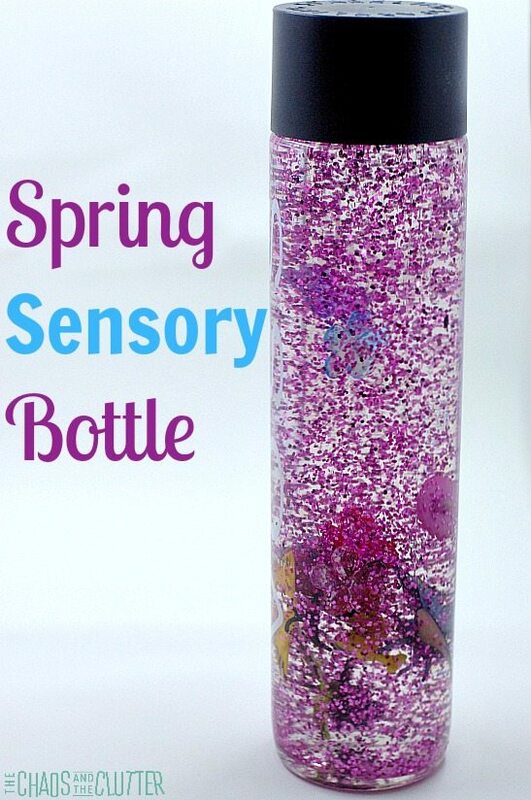 We have been enjoying our sensory bottle creations and it is always fun to come up with new themes and ideas for them. 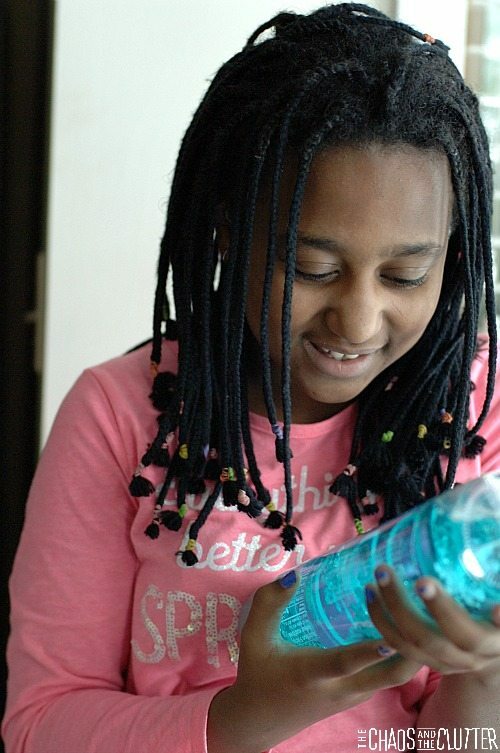 I was inspired to make this sky sensory bottle after making our sky sensory bin and wanting to use the adorable parachute glider that was in the In the Sky toob I used to make that sensory bin. 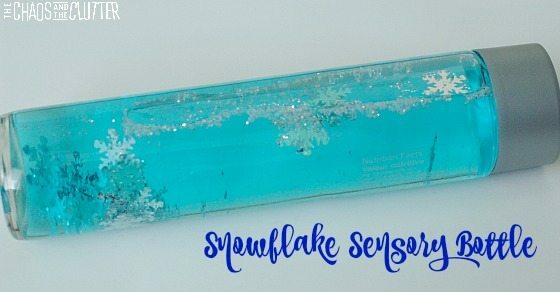 After I made this sensory bottle, I was trying to take pictures of it inside where I normally take photos and my daughter Granola Girl insisted that Sky sensory bottles needed to be played with (and therefore photographed) outside! Granola Girl loves to be barefoot, loves to be outside and feel the grass between her toes. I never think to bring our sensory activities outdoors so it’s nice to have her to remind me to expand my way of thinking. 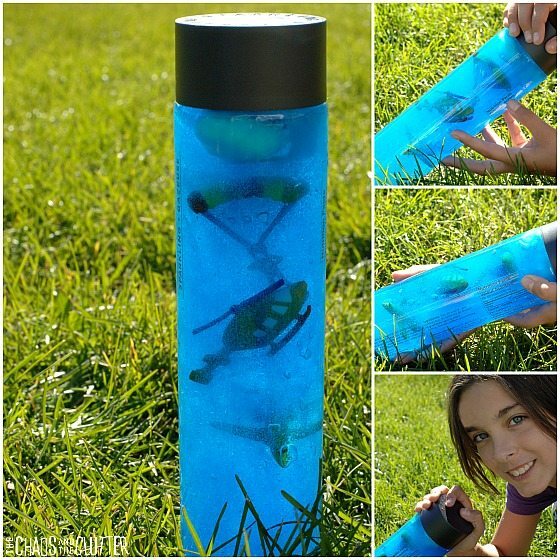 She was absolutely right about the sky sensory bottle belonging in the great outdoors! She practised her hand modelling skills while I took the pictures and then she ran off to explore with the sensory bottle, holding it up to the sky to see what it looked like with the sun shining through it. I’m so glad she has such a free spirit and reminds me of the beauty in simple things. 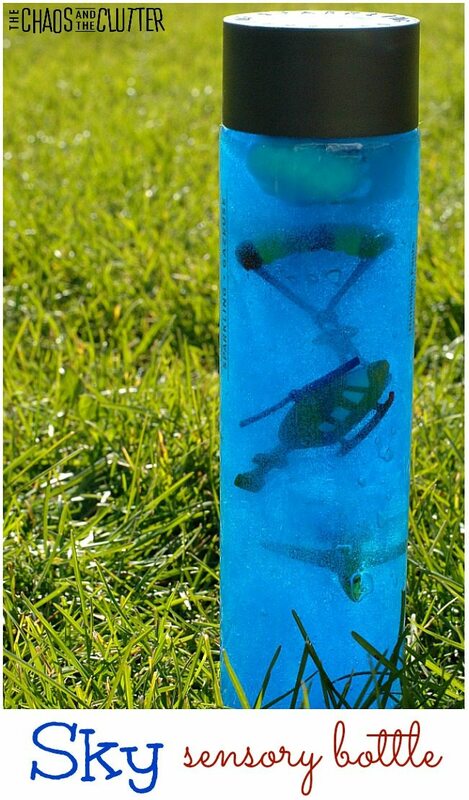 Empty the water from the water bottle and then squirt some gel into the bottle and add an item from the In the Sky Toob. 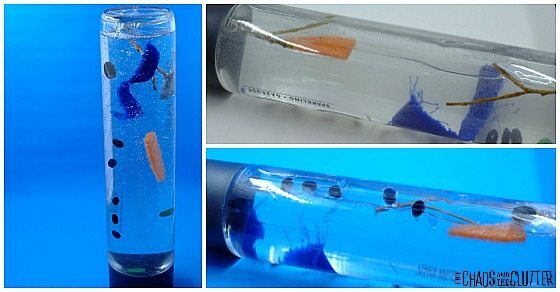 Continue to layer gel and items from the tube so that the items suspend in the blue “sky”. 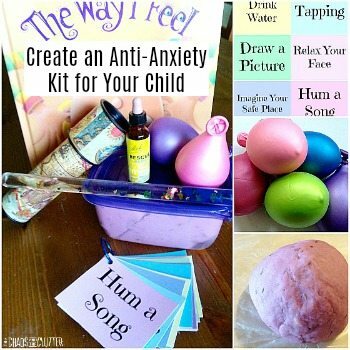 Add the lid and your sky sensory bottle is ready to use for play. 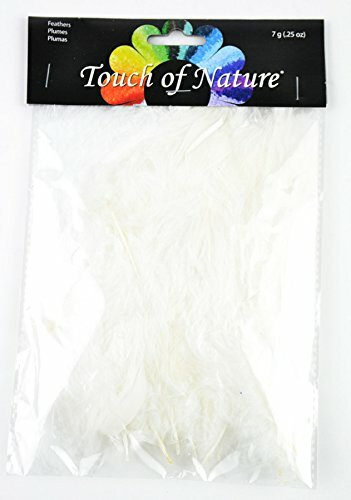 If you have younger children, you may want to hot glue the lid in place so that they can’t open it. 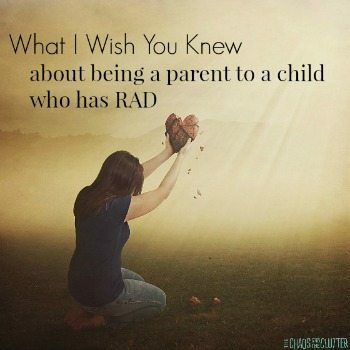 As with all sensory and exploration activities for kids, adult supervision is recommended. 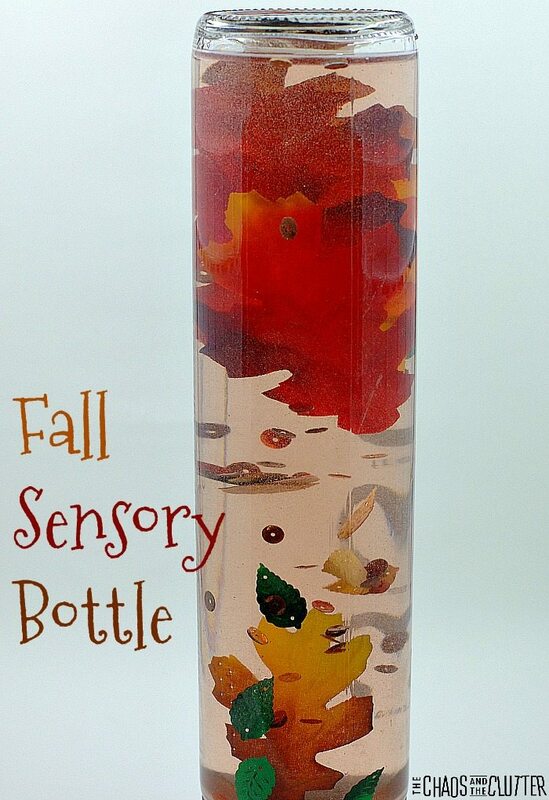 This Fall Sensory Bottle is lovely for discovery of the season and can be used as a calm down bottle as well. Kids will love watching the falling leaves (no pun intended!) and shiny sequins. 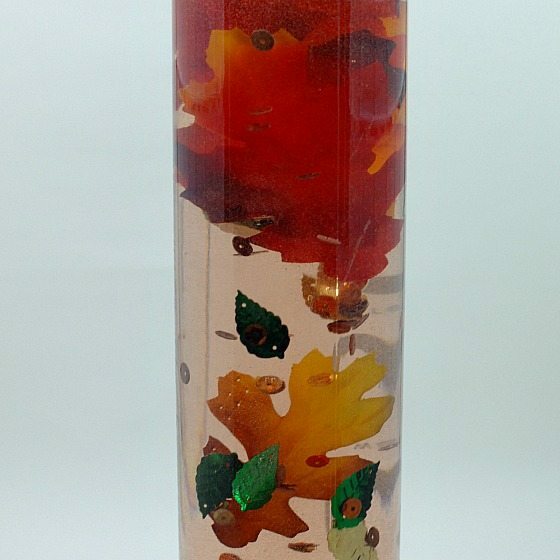 Place the plastic fall coloured leaves, leaf shaped confetti and glitter in an empty water bottle. Fill with water and replace the lid. 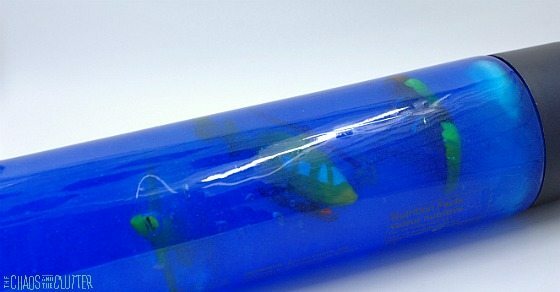 If you’ll be using this fall sensory bottle with younger children, you may want to secure the lid with hot glue so that they won’t be able to open it. 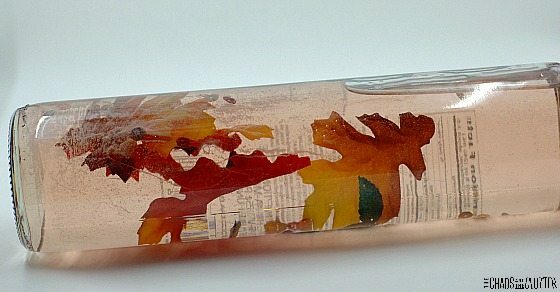 The colours in this sensory bottle are lovely. 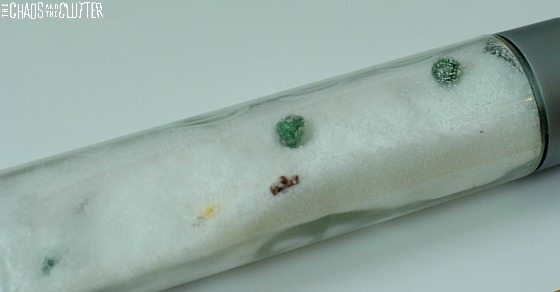 When I added the water to mine, the plastic leaves’ colour bled just slightly making the water a hint of a fall orangey-red colour. I like googly eyes. I blame my friend Christie. She thinks that everything is better with googly eyes and puts them on random things like plants all over her house. It’s funny and cute and it’s apparently rubbed off on me because now I buy googly eyes and use them for strange things like this monster sensory bottle. 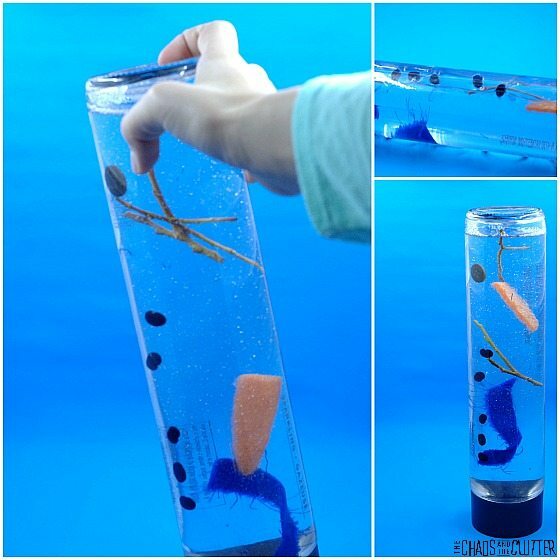 To make this monster sensory bottle, pour hand sanitizer to almost the very top of an empty water bottle. Next, add the googly eyes and the googly eye finger puppets. 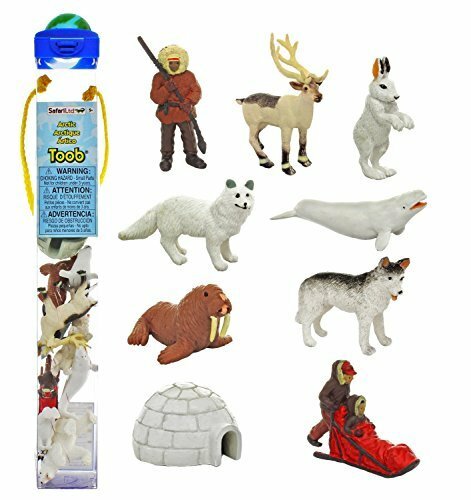 Note that you will have to straighten the finger puppets to get them through the small opening at the top of the water bottle. 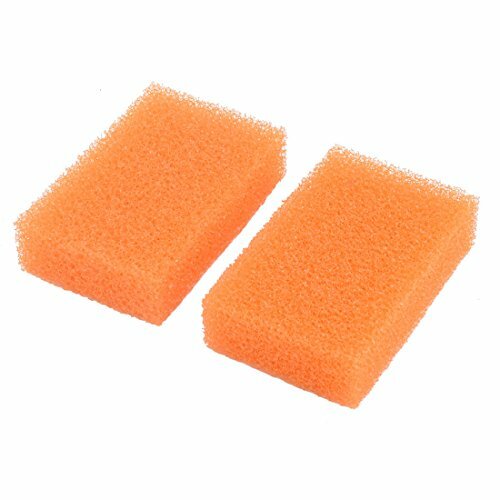 Once they are pushed through, they will go back to their proper shape. 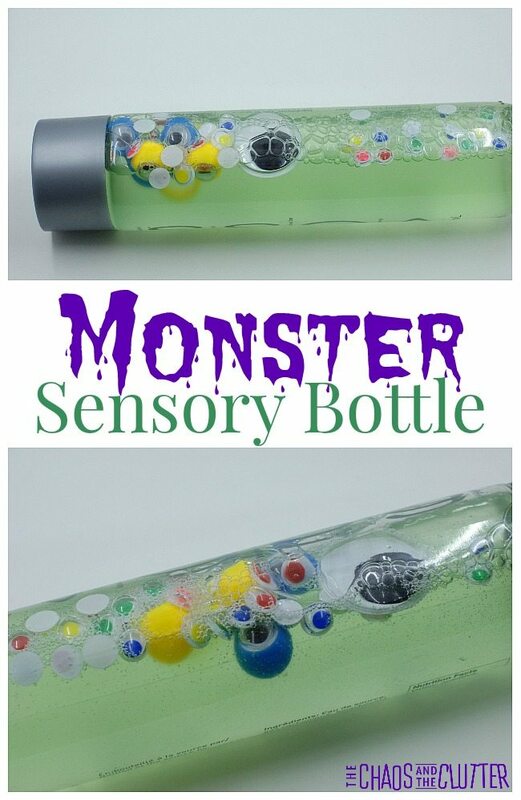 If you want to make this sensory bottle even more fun for children to play with, give them some foam stickers to add to the outside of the bottle to personalize their “monster”. 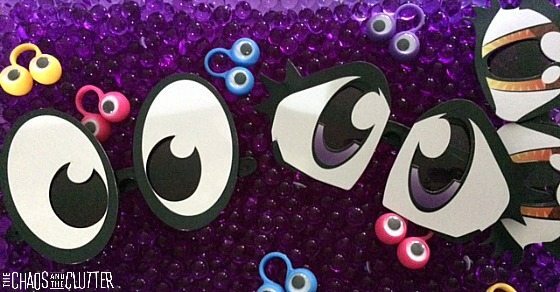 I like the large googly eyes myself, but my kids seemed to prefer the eyes in different colours. 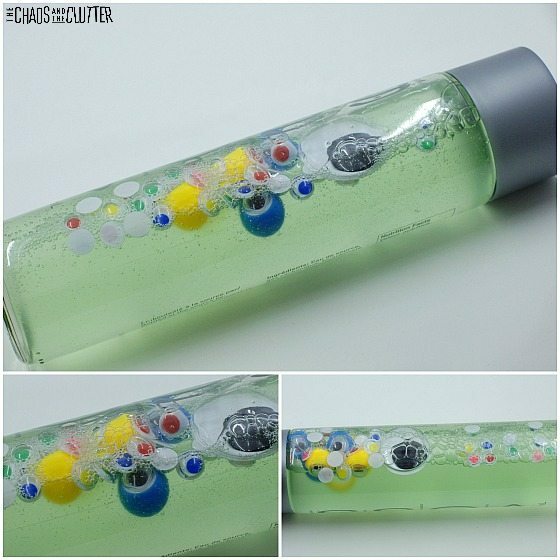 This is a very simple and inexpensive sensory bottle to make. 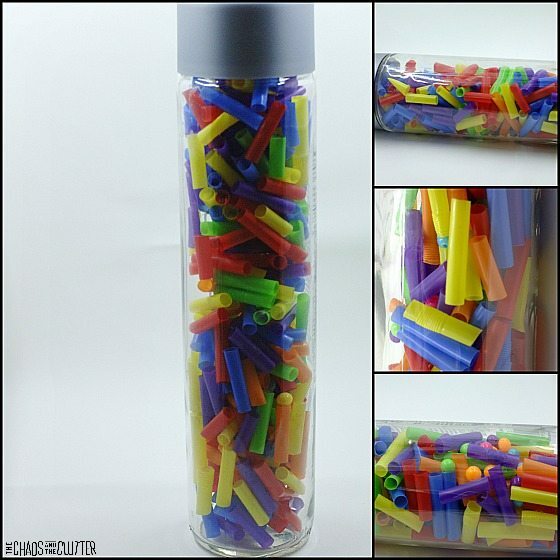 Kids can explore different sizes and colours while playing with this monster discovery bottle. 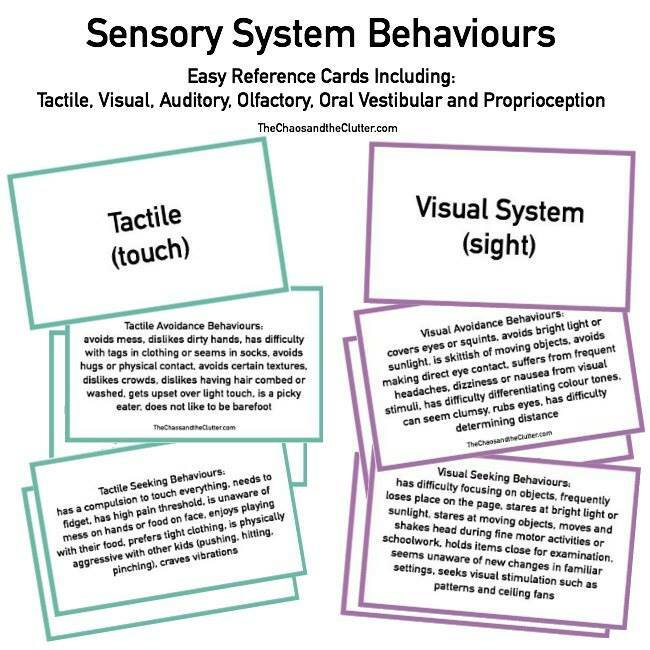 If you are looking for other monster ideas, you may also want to check out our Monster Sensory Bin or our Eyeball Sensory Bin. I find inspiration for sensory activities at the strangest places. Looking through my cupboards, standing in line at the grocery store glancing at magazine covers, walking the aisles of the craft or dollar or hardware store, or even being outside can lead to an idea. They don’t always work out the way I envision they will, but this spring sensory bottle came together nicely. I love the fresh colours of spring. 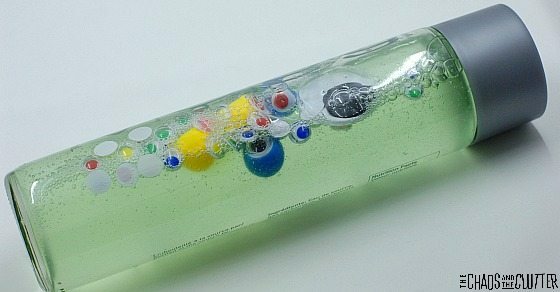 That and a package of cute buttons were the inspiration behind this discovery bottle. 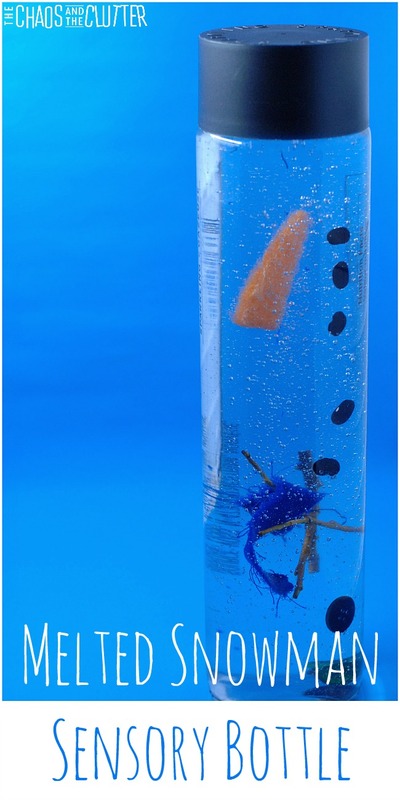 To make this spring sensory bottle, pour the bottle of glue into an empty water bottle. Add warm water to almost the top of the bottle, put the lid on and shake well to mix. 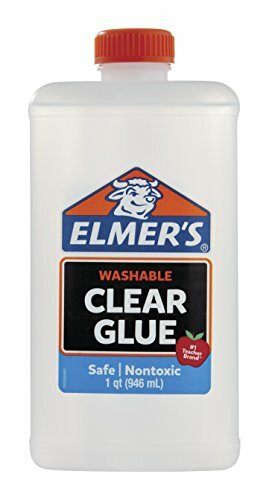 I added a bottle and a half of glue but it was a bit too much glue and the glitter stuck together, so I would recommend using only one bottle of glue. 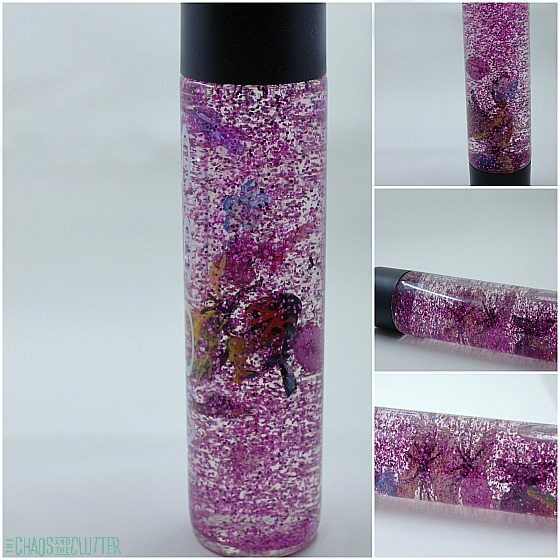 Once the water and glue are well mixed, take the lid off and add the glitter. 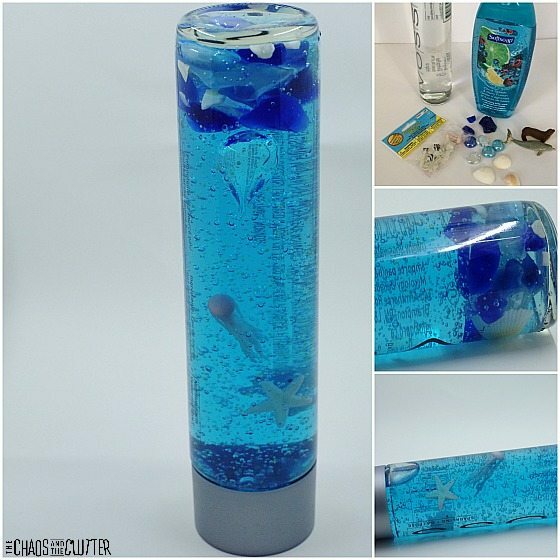 Drop the small buttons and flowers into the bottle. 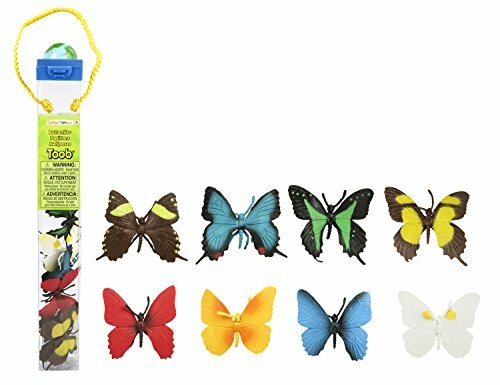 The butterflies from the butterfly Toob are a bit too big to fit but if you bend the wings in, they go in easily and then their wings will open when they are past the smaller opening of the bottle. Twist the lid back on and give the bottle a shake. 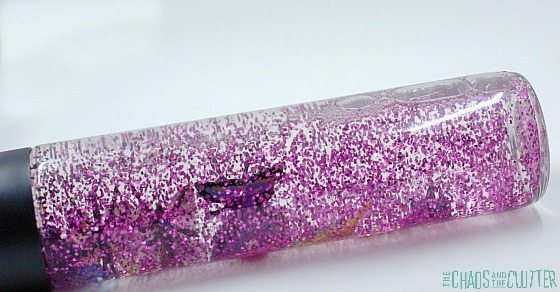 The items and glitter will fall slowly because of the glue in the bottle which makes it a good calm down bottle. 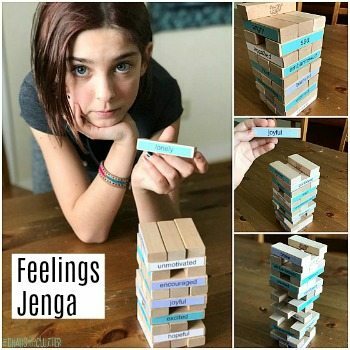 If you have little ones and are worried about the small parts being a choking hazard, you can secure the lid with a hot glue gun.